A fresh tomato is a delight — until it's spent a few days in the refrigerator. Then it transforms into a mushy, tasteless mess. 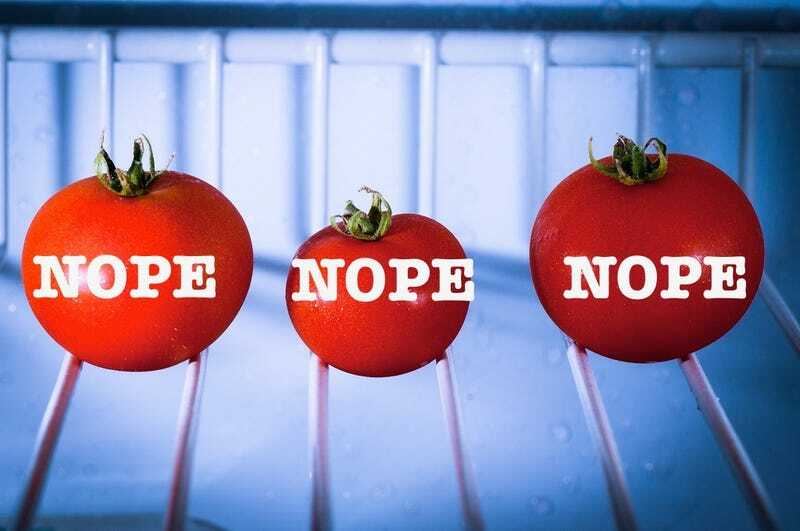 Here's the scientific reason why you should never, ever refrigerate your tomatoes. But — if you absolutely must — there is a way to do it. The flavor of a tomato is the result of a mix of sugars, acids, and volatiles (the compounds that produce aromas). It's in that last category, the volatiles, that the trouble with refrigeration begins — and unfortunately that's also that same category where a lot of the tomato's distinct flavor comes from. Researchers in France recently undertook an analysis of just was happening to the volatiles in tomatoes stored at room temperatures, versus tomatoes in cold storage. When stored at 68 degrees fahrenheit, they found that a ripe tomato not only maintained existing volatiles, it actually continued to produce more. In other words, the tomato's flavor just kept on getting more and more tomato-y. When stored at 39 degrees, however, volatile production didn't just stop, existing volatiles actually began to break down. What's more, the loss in volatiles wasn't equal across the board — it was targeted. Different volatile compounds import different kinds of flavor notes. The volatiles associated with the notes typically described as "grassy" or "green" in tomatoes took an especially hard hit, which is why that "fresh picked" flavor is the first to go when a tomato sits in your refrigerator. The loss in flavor is not purely a chemical problem, though — there's also the texture of the tomato to worry about. It turns out that, for a sensitive fruit like a tomato, temperatures don't necessarily need to be drop below freezing in order to be damaging. Anything below 50 degrees can put the tomato at risk of a chilling injury, the symptoms of which include softening and pitting. The end result? A spongy, flavorless tomato. So far, both science and our tastebuds seem to be converging on one simple point: For God's sake, just keep your tomatoes out of the refrigerator. There is, however, a seeming exception to this rule: soups and sauces. Sticking a soup or a sauce in the fridge for a day or so doesn't tend to hurt the flavor — in fact, in a lot of cases, a soup or sauce that's had a little time to mellow in the fridge tastes even better. So what gives? Some of it is simply down to the fact that the flavors have had more time to mingle and soften together into a more cohesive whole as they aged. But, in the case of tomato-based soups and sauces, it's also due to the fact that what you're tasting in that soup or sauce, while delicious, probably isn't really tomato. In processed tomatoes the first thing they do is boil the fruit to remove most of the water. That's how you get 10 or more fruit into one of those tiny cans of paste. The volatiles are long gone from any cooked tomato product in a can. I asked a processor once why the don't capture the volatiles and add them back after cooking - a process widely used in the orange juice industry. He said they don't rely on real tomato flavor. They add taste back in the form of basil, oregano, garlic etc. You aren't tasting the natural taste of a tomato in those things [sauces and soups] you asked about. Just once, try a recipe for tomato soup where you add fresh pureed tomatoes at the very end. See how different it tastes. Ideally, tomatoes should be kept out at room temperature. But, if you must refrigerate them, there's still a few things you can do to minimize the damage. The simplest method is, of course, eating them cooked instead of fresh. Tomatoes stuck in the fridge for a week might not suit a salad, but they're still a delightful addition to a sauce, a soup, or a curry. Intriguingly, there's also some evidence that the damage done by refrigeration could be reversible, at least in part. In the volatiles study, researchers found that, even after up to 6 days in the fridge, spending 24 hours out on the counter at room temperature was enough to kick at least some of the tomato's aroma producing compounds back into gear (though never quite back to their original levels). So, if refrigerating your tomatoes is a must, you might try letting them spend a day out on the counter to see if they re-coup some of their original flavor. There's also one other potential solution out on the horizon, though it's probably pretty far away. Most of the currently available varieties of tomatoes are very sensitive to the cold. There are, however, other varieties out there that could conceivably fill the gap for a refrigeration-resistant tomato if not now, then sometime in the future. "We are looking for varieties that are resistant to chilling injuries by exploring the wild [tomato] relatives that live high in the Andes mountains," Klee says. "But that's a very long process." In the meantime, though, the best, easiest, and most delicious, fix might just be to start storing your tomatoes out on the kitchen counter in the first place.